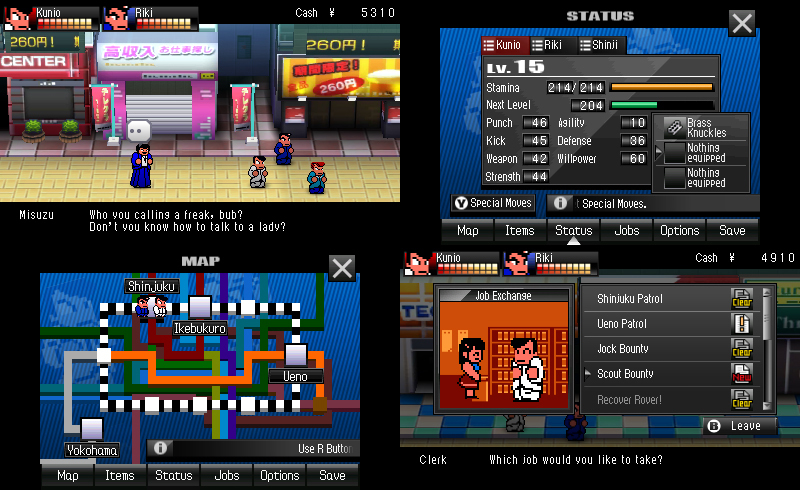 River City: Tokyo Rumble is a game out of time, and maybe not in the way you’d expect. 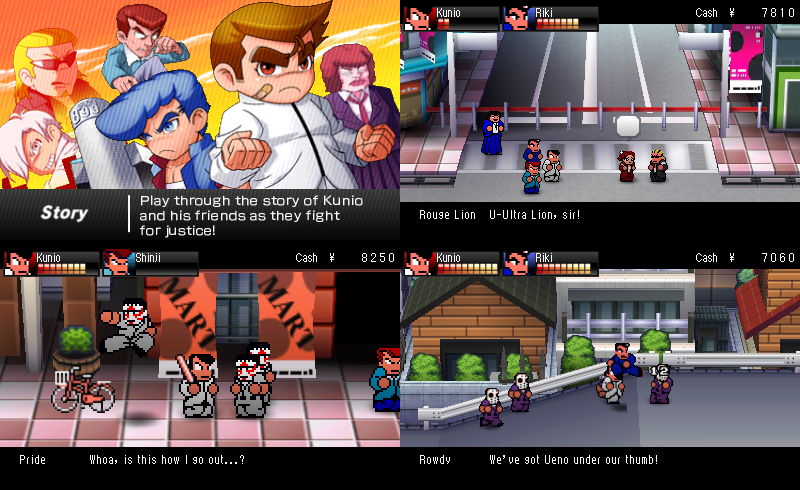 Sure, it’s an homage to the NES-era Kunio-kun classics, most notably River City Ransom, but the homage itself was released at a very different time. Here we are in 2016, with a game five years removed from its initial release. And it’s through that lens that the game makes a lot more sense. 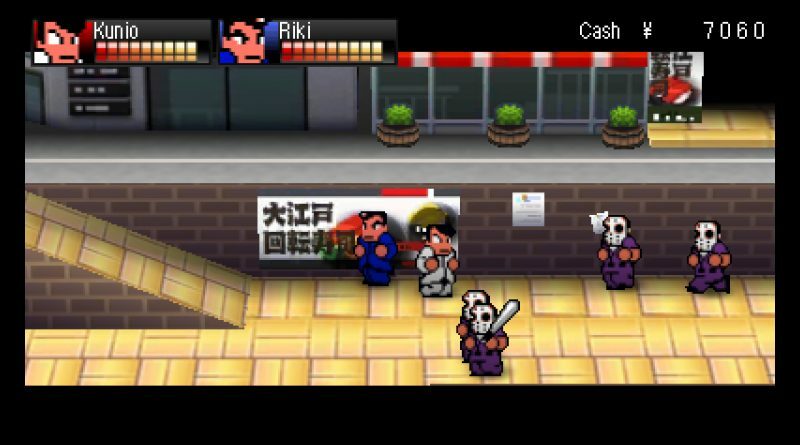 Essentially, River City: Tokyo Rumble is a direct sequel to River City Ransom, and follows many of its plot points. You’ll grab a computer-controlled pal, beat up a bunch of weird gangs and generally engage in quirky, pleasant thuggery. It may feel a bit different for fans of that game, though, since this time it retains its Japanese names and locations. It was always Kunio in Tokyo in the old titles, but now the English acknowledges it, and it makes things hold together a bit better. Also there’s a bit more room for text now, so you get to see… well, you get to see just how horrible Kunio is to basically everyone. Whimsically horrible, maybe? Definitely not respectful at all, though. Tokyo Rumble‘s 3DS launch-era origins explain many of its quirks. It pushes hard to add multiplayer options, like a barebones “dodgeball” mode that I’ll get to later. It tries to use the second screen, but doesn’t quite get its mind around how it should work. Most notably, though, it’s likely an attempt to implement more dynamic 3D that led to its decision to scale and blur its trademark sprite art. In cutscenes, certain side games and occasionally if you’re in the right part of the screen, you’ll get the crisp art you want. Otherwise… yeah. You’ll grab a computer-controlled pal, beat up a bunch of weird gangs and generally engage in quirky, pleasant thuggery. If it wasn’t due to 3DS launch concerns, it’s due to a sort of identity crisis that the Kunio-kun games have dealt with in Japan for the past decade. Leaning into the old sprites can totally work, but overlaying them over nondescript polygonal backgrounds? And accompanying this play with a MIDI-style soundtrack that splits the difference between nostalgic and modern and ends up just feeling awkward and dated? I wish I could report that these issues have been worked out in the intervening years, but… no, not really. The series is still finding its way. The second element that really defines this game is its nature as a revival of the brand. It was a celebration of Kunio’s 25th anniversary then and serves as a 30th one now, and it combines that spirit with a return after nearly 15 years of the franchise barely existing at all. 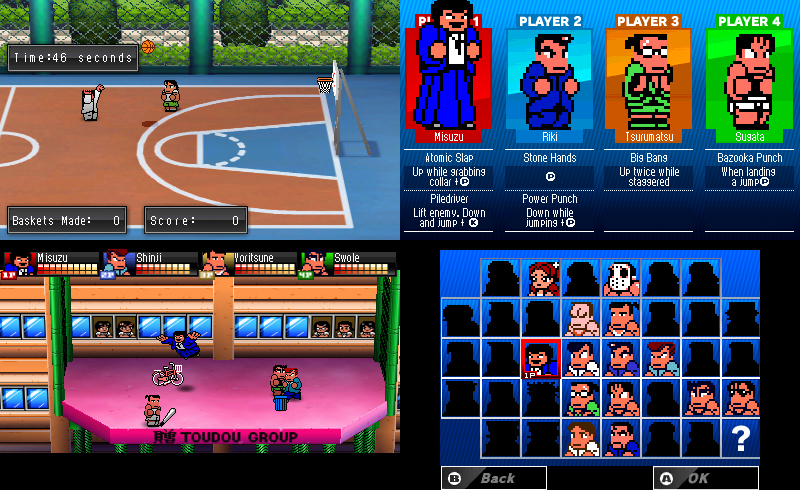 So yes, it’s a River City Ransom tribute, but it also takes the time to make nods at the other sorts of outings in Kunio’s past, like dodgeball and basketball. These little games aren’t as good as the real thing — “basketball” is a barebones timing-based shooting challenge and “dodgeball” is just fighting with all moves disabled but jumping, grabbing, catching and throwing. We wouldn’t mind real dodgeball again, but this isn’t that. Tokyo Rumble starts off incredibly slowly, but picks up in complexity and fun once you start buying more of Kunio’s moves. With the proper context in place, we can talk about how the game actually plays. The answer? It starts off incredibly slowly, but picks up in complexity and fun once you start buying more of Kunio’s moves. The first one you’ll find is a Dragon Kick that lets you essentially deal triple damage, and that and other moves will accelerate the initially-arduous task of just hitting goons enough times. Once you get far enough into the game, random punks will be a breeze but boss-battle sequences can still be a bit of a challenge. That’s when the game’s quest systems, equipment, secret shops, varied partner abilities and charming localization really get to shine. It’s weird to have the benefit of hindsight at the time of a game’s release, but here we are! Even in 2016, River City: Tokyo Rumble can be a lot of fun, but we can’t help but hope that this is the start of a larger effort to see these games worldwide. What they lack in, well, many things, they compensate with quirk and silliness, and we need more of that these days. Questions? Check out our review guide. A review copy was provided by the publisher or developer for this review.